This idea is about how social and market norms influence your brand’s relationships with consumers. Below we look at the key concepts of norms and why it is important to consider under which norm your brand operates. 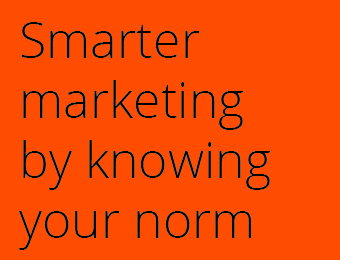 Knowing the norms has the potential to enable better future decisions making about the type of relationship you wish to pursue with your potential consumers. Research has shown that there are two types of markets that determine relationships between effort and payment: monetary and social markets. These markets are directly linked to norms. As an example: if you buy something transactional – like tickets to the cinema – that links to market norms, but If your friend cooks you dinner at their place that would link to social norms. These norms determine if the relationships is social or market oriented. This is why people sometimes put more effort into exchanges which have no payment (a social market), e.g. helping a friend to move apartment, than they do when they receive low payment for their efforts(a monetary market). The effort invested and the rewards expected therefore operate under different conditions. If the market is influenced by both social and market norms the result tends to more closely resemble monetary than a social market. In a study conducted on day care centers where they tested social vs market norms researchers found that having a market norm (with a monetary fine) actually increased the number of parents arriving late to collect their children as it was perceived as a fee for the option of arriving late, the opposite of how it was intended to work. By creating a fine it shifted the day care-parent relationship to a market transaction instead of being an unwritten social contract that you arrive on time to collect your children. We would encourage you to map out the different interactions and types of communication (touchpoints) that your brand has with consumers in order to get an idea of the market in which your brand currently operates. By doing this it is possible to avoid a mismatch in expectations due to a clash of market and social norms. Returning to the example about dinner at a friend’s place, think about the following scenario; if you instead of giving your friend a customary bottle of wine on arrival you hand them 10 dollars (which is the same value as the wine) and thank them for “the great food”, you would turn it into a market transaction and violate the social norm. This will probably also ensure that you are not invited for dinner again. This is obviously not something most people would do, yet today we have marketers interchanging norms and confusing consumers in what to expect of interacting with the brand. Is this brand trying to be my friend? Or does it just want my money? This confusion is especially true in social media and online business where marketers usually desperately are trying to create a social relationship without thinking about the requirements of that type of relationship. By building a social relationship and moving away from transactional market norms other qualities are required from your business. We are not recommending one norm over the other, they fill different purposes, we would however recommend a suitable preparation and level of knowledge about which norm your brand is mostly operating under to avoid mismatch in expectations which can devastate relationships with consumers. By familiarising yourself with the dominant norm (social vs. market) under which your brand operates you can avoid customers becoming disgruntled by a mismatch between their expectations and experience, resulting from a clash of social vs market norms. As a marketer you always need to be on top of how consumers relate to your brand and by looking closer at the norms and mapping the consumer touchpoints you can enable a better relationship between your brand and potential consumers.